Pharma Has What Kind Of Corporate Reputation? Anyone who pays attention to the pharmaceutical industry is probably aware that corporate reputation has been stuck in the ‘damaged goods’ file. Chalk that up to years of controversy over safety, pricing and transparency. And the problem persists – in a big way, according to a new survey of patient groups around the world that considered 29 large drugmakers. The overall industry reputation, in fact, has taken a dive. Only 34 percent of 600 patient groups say that multinational drugmakers had an ‘excellent’ or ‘good’ reputation last year, according to Patient View, the research firm that conducted the survey. This compares with 42 percent in the 2011 survey of 500 patient groups. In general, 40 percent of the 600 patient groups believe industry reputation declined in 2012, and as many as 50 percent of the 600 respondent patient groups say that industry had a ‘poor’ record last year for fair pricing policies. And 48 percent reported industry had a ‘poor’ record of being transparent. The survey asked patient groups – some of which do receive financial backing of various sorts from the pharmaceutical industry – to rank 29 drugmakers on six indicators that influence corporate reputation: patient-centeredness; patient information; patient safety; useful products; transparency; and integrity. When comparing 2012 with 2011, the survey found the biggest drops took place in managing bad news about drugs — a 29 precent plunge; having ethical marketing practices — a 23 percent drop, and having a good relationship with the media — a 19 percent dive (here is the summary). In fact, many patient groups referred to negative press to explain why they downgraded their opinion of some drugmakers, particularly concerning patient safety, transparency and corporate integrity. 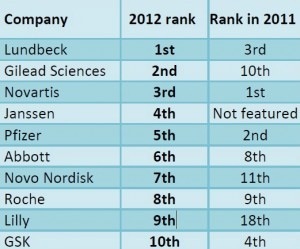 Drugmakers with a high exposure to ‘bad stories’ in 2012 saw their rankings drop, PatientView writes in its report. Others benefited as a result. There were many reasons, in fact, cited for the poor performance. Among them: a continuing failure to help patients in cash-strapped countries, such as Greece and Spain, gain access to medicines; a preoccupation with drugs that offer short-term health benefits and not enough effort made to discover new drugs for neglected groups of patients. What else? Patient groups also pointed to inappropriate marketing, a designation that included off-label marketing; a perceived lack of transparency, especially in reporting disappointing trial results; and prices that, in some cases, are still unaffordable and give the impression that profits come before patient well being. Other findings: nearly 11 percent of the groups believe no drugmaker has a ‘patient-centered’ strategy and nearly 13 percent say no drugmaker provides high quality patient information. Eleven percent believe no drugmaker has a good record on ensuring patient safety, 9 percent believe that drugmakers are not providing useful products, 15 percent believe drugmakers are not transparent and 13 percent say there is no record of integrity. What else? The drugmakers that dropped the most in rankings were GlaxoSmithKline, Merck, Shire Pharmaceuticals, Baxter International and Takeda Pharmaceuticals. Meanwhile, Gilead Sciences, Eli Lilly, Allergan, Bristol-Myers Squibb, Boehringer Ingelheim and Teva Pharmaceuticals scored the largest gains. And who ranked last? The distinction went to Takeda. Teva was ranked second-to-last. Brand-name drugmakers, by the way, ranked poorly compared with other players in the healthcare sector. A higher percentage of patient groups graded retail pharmacists, medical device maker, for-profit health insurers, biotechs and generic drugmakers as having ‘excellent’ or ‘good’ reputations last year. Only non-profit health insurers fared worse. Which drugmakers were reviewed? Abbott Laboratorires (ABT); Allergan; Amgen (AMGN); AstraZeneca (AZN); Baxter; Bayer; Biogen Idec (BIIB); Boehringer Ingelheim; Bristol-Myers Squibb BMY); Celgene CELG); Lilly (LLY); Gilead Sciences (GILD); Glaxo GSK); Johnson & Johnson’s Janssen (JNJ); Lundbeck; Menarini; Merck (MRK); Merck KGgA; Novartis (NVS); Novo Nordisk; Pfizer (PFE); Roche (RHHBY); Sanofi (SNY); Servier; Shire; Stada Arzneimittel; Takeda; Teva (TEVA) and UCB. Listed below are links to blogs that reference this entry: Pharma Has What Kind Of Corporate Reputation?. This page contains a single entry by Toni published on January 15, 2013 10:20 AM. Iodine Protects Against Fluoride Toxicity was the previous entry in this blog. Vaccinating Healthcare Workers Doesn’t Help Patients: Cochrane Study is the next entry in this blog.